Conor McGregor’s UFC career is lacking direction at the moment, one may say. But, the Irish superstar doesn’t mind catching the tiger by the tail (excuse the pun). The 30-year-old is currently enjoying some downtime in Russia, having attended the FIFA World Cup final between France and Croatia on Sunday night. Following the match, McGregor crossed paths with Russian president Vladimir Putin as the duo posed for a hugged-up photograph. And now, he seems to have set out to explore the country. A video of McGregor meeting and feeding a sedate-looking tiger went viral on social media. 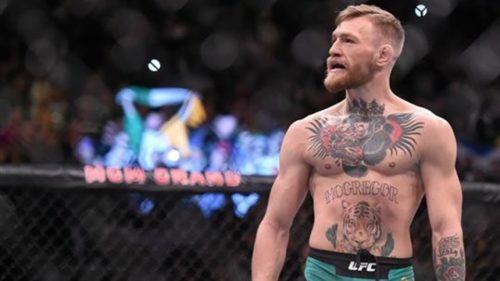 He later takes his shirt off, as can be seen in the clip below, to show the tattoo of a tiger on his torso as he expressed interest at wrestling with the big cat (in jest, of course). Meanwhile, the former featherweight and lightweight champion is currently fighting a case in the United States after he was arrested earlier this year for attacking his opponent’s bus. He will have to seek clearance before making his return in the octagon.